Buenos Aires - Diego Maradona wants to return to the position of Argentina coach and is willing to work for free, as Jorge Sampaoli faces pressure to resign following their Soccer World Cup travails. 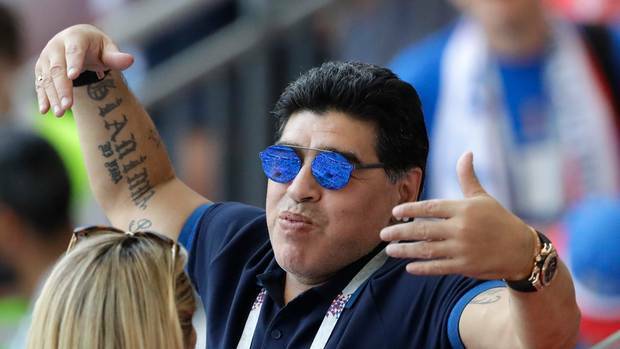 Speaking on his "Hand of God" television show, the 57-year-old Maradona, who coached Argentina for two years from 2008-2010, said it was painful to see the current state of the national team. "I would return to leading the national team and I would do it for free, I wouldn't ask for anything in return," Maradona said on his programme, which runs on Venezuelan channel Telesur. Sampaoli is resisting intense pressure to resign following Argentina's 4-3 defeat to France on Saturday during a World Cup campaign that was fraught with tension and disputes. Sampaoli, though, has another four years to run on his contract, meaning the Argentine Football Association (AFA) would have to pay a reported $15 million to sack him. "Hopefully God will give me the strength to return to the bench," said Maradona, whose own World Cup coaching campaign in 2010 ended in an ignominious 4-0 thumping by Germany in the quarter-finals in South Africa. "I'm 57, watching my country, which was beaten by a team that isn't one of the best in the world - it really hurts to see everything that we've built destroyed so easily." Maradona was a genius as a player, leading Argentina to World Cup glory in 1986 and again to the final four years later. But his coaching career has been far less glamorous despite his stint in charge of the national team, in which he presided over a record-equalling 6-1 defeat to Bolivia.